Hanuman Jayanti is the birth day of Lord Hanuman. 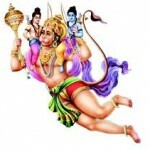 Hanuman Jayanti is celebrated on Chaitra Poornima or the full moon day of the Chaitra masam of the Telugu calendar. 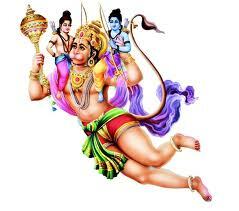 Hanuman Jayanti will be celebrated on Tuesday 15th April 2014. Lord Hanuman is well known for his strength and his devotion for Lord Sri Rama. Devotees throng the temple of Lord Hanuman on Hanuman Jayanti and offer their prayers. Red Shoe flowers are offered to Lord Hanuman on Hanuman Jayanti. Appalu a sweet prepared using rice flour and Jaggery is offered as Naivedyam on Hanumna Jayanti. Reciting of Hanuman Chalisa on Hanuman jayanti for 108 times is a common ritual. Reciting the name of Lord Sri Rama also would please Lord Hanuman.